Have you played the Age of the Gods slot by Playtech yet? That’s the first in a trilogy of superb slots just released by this software provider. Here we have Age of the Gods: Furious 4 and we’ve got the third title, Age of the Gods: King of Olympus under review as well, but first let’s see whether the second title in the series lives up to the delights offered by the first. 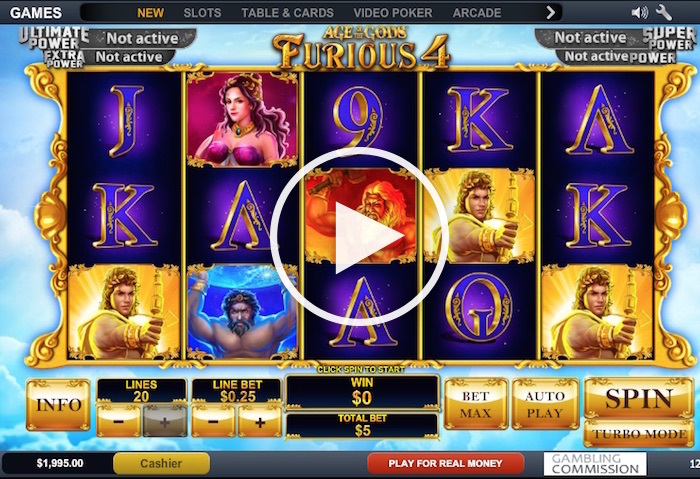 The Age of the Gods: Furious 4 online slot is a 5×3 slot with 20 paylines. It is part of the Playtech Age of Gods series that has already grabbed gaming headlines worldwide. The reels have the same dark blue hue the first game has, but the background is very different. With different gods and rules in play, there is good reason to try Furious 4 as well as its predecessor. Despite the many varied features on offer, you’ll get the familiarity of assorted symbols as well as a wild and a scatter. 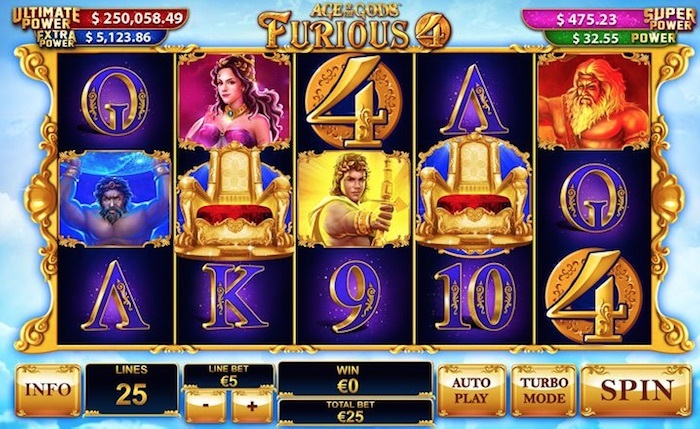 Furious 4 adds payout power to the Age of Gods Slot Series through multiple jackpots! Playtech can be relied upon for high-quality graphics and they deliver again here. White fluffy clouds float behind the reels, which are touched with gold at the edges. The entire game has a richness that really appeals, not to mention being quite suitable for the theme itself. The game controls are easy to work with too. Plus and minus buttons allow you to choose your lines and your coin values before each spin. You’ve got a turbo mode to speed things up a bit, but we prefer playing at normal speed so you don’t miss anything. The Furious 4 in the title relates to the four Greek gods in play in this game. These are Apollo, Pandora, Hephaestus and Atlas. Yep, we knew all of those apart from the one beginning with H… but whether you can pronounce it or not, you can check out all their super powers on the paytable. Incidentally, Apollo brings the biggest payouts, followed by the others as mentioned above in turn. The paytable reveals how each of the Furious 4 features will work in the free spins round. This is similar to how the first Age of the Gods game works, in that you get different versions of free spins to play. Near the end of the eight-page paytable you’ll also learn about the jackpot feature that has four progressive jackpots available. These are the Power, Extra Power, Super Power and Ultimate Power jackpots. Let’s start with the basics. A golden 4 in front of a golden circle is the wild. This offers the biggest payout opportunity aside from the progressive jackpots if you get five on one line. Do this and you are rewarded with 10,000x your triggering bet. Next up is the scatter. This is a golden throne, vacated for the moment at least. Three or more appearing anywhere will give you access to 12 free spins. It is during the free spins that you can unlock the Furious 4 features. During the free spins, the centre reel can appear stacked with one of the four gods. When this happens, you trigger a Furious Feature. The Age of Light feature grants four free spins during which Apollo becomes an expanding wild. If you get the Age of Curiosity feature, you will enjoy an increased multiplier during four free spins. Next up is the Age of Fire feature, in which the first reel is a stacked Hephaestus through four free spins, and you also get additional appearances of him on the other reels. Finally, the Age of Endurance feature grants three free spins. While you get one less additional spin, Atlas will appear as an extra wild. When he does appear, he will freeze in place for the remaining spins. With a 20p minimum bet, which means putting one penny on each of the available paylines, you can see how affordable it is to have a go on this game. Adjust up your bet if you want to increase any potential wins you might get. You can play for free, but this doesn’t lead to real prizes, nor does it put the progressive jackpots into play. The maximum spin for the Furious 4 Slot is a staggering £500 that could suit high rollers looking to tap huge progressive payouts. The return-to-player is very impressive, and is consistent with the other two Playtech slots in the Age of the Gods series. The various prizes are indicated quite clearly on the paytable pages as well, which does make life easier. An RTP of 93.88% to 94.88% is currently being reported for Furious 4. Playtech slots for UK players are always good fun, and this one shows just how exciting their games can be. The trilogy of games is among the latest Playtech slots, and many players have been thrilled at the many additional features they offer. Play on your desktop, on your mobile or your tablet – but be sure to play it today.